Such a great card Lynn, fab colouring and I like those pretty papers. Thanks so much for agreeing to be part of the ADU team... we are so happy to have you with us! With ya there Lynn! Getting dressed up these days takes me about 4 hours!! LOVE your card to bits! Love this image as it reminds me of my grandson Alfie. SO cute! Congrats on your DT position, I know you'll be an asset to the team! WHat a cute cute image and card with all those bright cheerful colors! I love the corner treatment and great papers!! NJ! OMGosh Lynn, that image is adorable, I love it!! Fabulous coloring and papers! AND a big congrats on your new DT! Congratulations on your new team, you definitely will be an asset! Your first card is fabulous and the papers are amazing and look so well together! Fantastic sky too! This is such a cute card! Everything about it is perfect! So super cute! Love that orange. Gorgeous card Lynn, I like the image the colours and the twine. Fabulous colour scheme! So nicely put together! Darling image, Lynn, and you really turned it into a sweet card. The twine is perfect and I like your dots on the sentiment piece also. Nice sky work. When I go in the garden to work and I am down on my knees, Daisey's idea of helping me is to continue to give me kisses. She stands their all excited with the tail wagging enough to send her into flight and whining until I stop what I'm doing to get kisses. I guess she thinks that is a big help and she is right. Have a tremendous day. I agree with you, Lynn, this is a very cute image. I love the papers, twine and kraft and the cool sentiment. Congrats for being chosen to be on the DP. Adorable card. Love the colors and your background looks amazing (my clouds never turn out half as good). Congrats on the new DT, Lynn! How exciting for you. 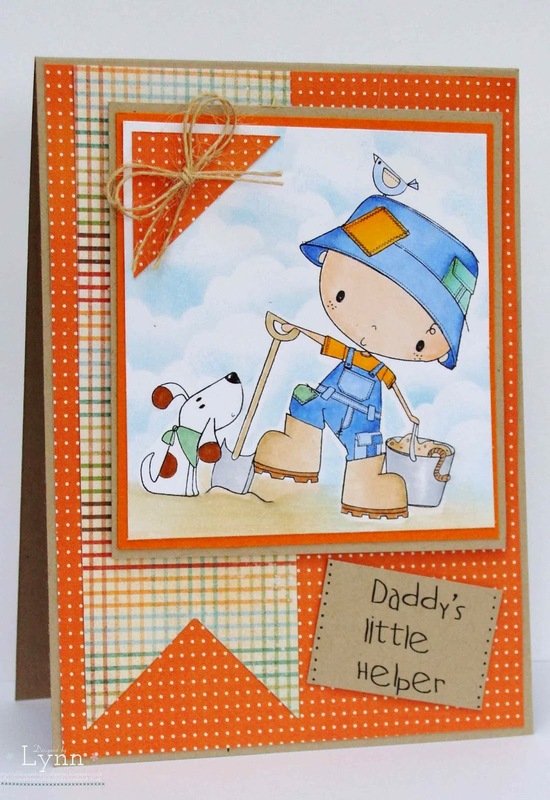 :-D Love this card and I'd say you "dressed it up" with all those patterned papers! Love your choices for those and that sky is incredible. What an adorable image! I'll have to go check out all her digis as soon as I'm moved and settled. So cute Lynn. Love the image. Congrats on being a member of the design team. 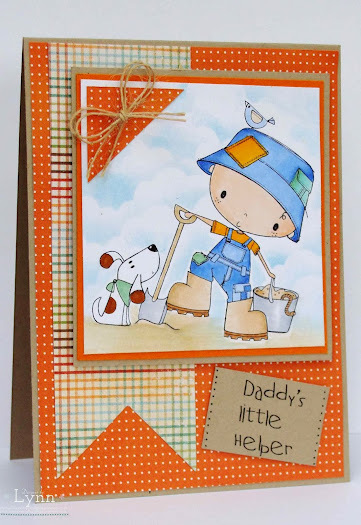 Love this darling card- and I can see Rambo out there digging in the yard. This card is fab! Congrats on the new DT- how lucky they are to have you showcasing their images!!! What pretty colors, Lynn! I especially love the paper in the corner of the design piece! And what an adorable image! Beautifully colored and sponged! Hi Lynn, glad you came by my blog. I think I see you a lot over on Carol L's blog. Your card is absolutely adorable. Congrats on your new DT assignment. I've looked at some of your other cards and they're all fabulous. Congrats, Lynn!!! I can see why they wanted you on their team...you really brought this adorable image to life with your fabulous coloring!!! I'll have to go check out all the new images!!!! Fabulous colouring and paper choice Lynn for this little man.. love that perfect cloud effect background too! And all I can say is GO TEAM A!! Awwwww, he's so cute!!! And just look at his little dog there...precious! Lovely coloring, and that sky - Wow! The orange really pops the whole card! Great job! He is to cute! Aweome sky and sand~Fab as always! Congrats Lynn! You will make a super addition :) I love your little guy and the colors :) Fab job! Another design team! You are really somethin' lady! So glad to see your talents are recognized! This little guy is just a cutie and you colored it perfectly. Say hi to Rambo for me! This is adorable! The image is so cute and your papers look fantastic with it! Congrats on the new DT too! !